Torso pitch: -34° to +40° while standing. -35° to +49° while crouching. The Thanatos is a large, powerful, Inner Sphere Heavy Mech. With its heavy armor, wide array of Weapons, and high speed and maneuverability for an IS heavy Mech, with 360° torso twist, the Thanatos is a formidable Mech marred by its bulky, wide chassis and occasional Heat problems. All variants of the Thanatos come with varied pieces of Equipment, making it a very adaptable Mech capable of excelling in nearly any combat situation. Particularly, EVERY Thanatos come with GECM, making them excellent options if avoiding radar detection is of utmost importance. However, it is important to note that the Thanatos has a very large and very noticeable profile; it's relatively tall and extremely wide, making it easy to spot from a distance, as well as somewhat limiting the types of cover it can effectively utilize. The Thanatos Prime packs an Energy Weapon-heavy loadout consisting of an 2 ERLBLs and 2 ERMBLs. This diverse array of Lasers lends the Prime variant decent damage capabilities at nearly any range, and when supplemented by its MRM30, the Thanatos Prime can put alot of hurt on a target very quickly. GECM and C3 allows it to stay relatively concealed while sharing its radar information with allies, while Standard Jump Jets afford it additional maneuverability and poptarting capabilities. The Prime variant has excellent combat longevity due to both its large Energy Weapon arsenal, as well as the free ton for MRM30 reloads; however, with only 6 DHS, it suffers a bit when it comes to heat management. Also, due to the MRM30s long reload time and relatively challenging use, the Prime typically deals less damage over time compared to the other variants so Mechwarriors should be wary of not trying to bite off more than one can chew. The A variant is a fearsome mid-range fighter, stripping Heat Sinks and weaponry in order to cram in a mighty HGauss. 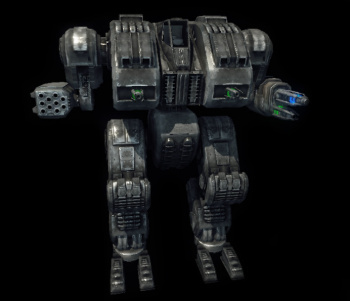 Supplemented by 4 ERMBLs, the Thanatos A is an excellent Mech in finishing-off the heavily damaged opponents. Added LAMS and GECM systems also afford it decent survivability. Improved Jump Jets can make it a devastating ambusher when used with Passive Radar. Although note the LAMS will break stealth on any enemy rockets passing by. Heat can be a bit of a concern, as the Thanatos A mounts only 2 extra Dual Heat Sinks, and though carrying 2 free tons, ammo can be a serious concern as this only affords a total of 18 HGauss rounds(6 loaded, 12 extra). The greatest weakness of this variant is it's greatest strength - The Heavy Gauss mounted on its arm is a very easy target with little armor, leaving it the first thing aware pilots shoot at. After taking down the primary gun, this variant remains relatively harmless. The Inner Sphere's only part time Arrow boat, the Thanatos B sports a single ArrowIV launcher, backed by a duo of LBX2 and an ERLBL. The Arrow launcher, with all of its quirks, forces the asset's operation to revolve around it. This mean you will need a forward observer to direct your artillery fire, or a vantage point that affords you to crouch in order to get a manual lock. An iNARC launcher allows the variant to attach targeting beacons to targets 900m out. The backup weapons are not too formidable damage-wise, but allow it provide decent direct fire support up to 1350m away with its autocannons and out to 800m with its ERLBL. In practice, its 2 DHS mean significant heat issues, especially when taking its Jump Jets into account, which are better off being used by themselves while getting into position or escaping, rather than for jumpsniping purposes. The "Bully's" flying twin brother, separated at birth, "Judo" sporting blistering close range firepower. The Thanatos C caries the AC20, a most formidable ballistic weapon by itself, accompanied by an trio of LPPCs and a quite pondering DSSRM4. Only three DHS, while able to keep the autocannon and missile launcher in check, will choke on every particle-cannon's trio volley. Save for the most dire moments, it is strongly advised to fire the later in succession rather than at once. 3 Free tons left for ammo, idealy for 1 AC 2 SRM. Difference from Bully is the continual screen shake delivery to the enemy, strong power of night vision denial, near permanent EMP output capacity and its ability to use Jump Jets to engage or disengage its foes. Nicknamed "The Bully" , Thanatos D will charge you at your weakest moment and turn you into slag while laughing off your attempts to retaliate. 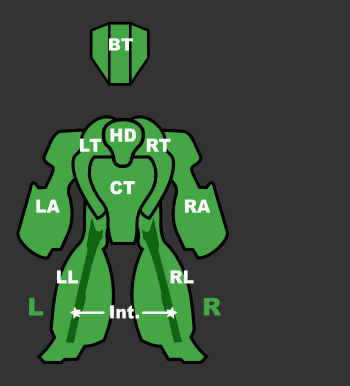 Equipped with an LBX20 on one arm, a DSRM6 on the other and a trio of MPL on its torsos, Bullycan make use of a tighter window of engagement despite sacrificing some dps compared to the C thanks to swapping autocannon models. 4 DHS mean heat is harder to manage and the laser array will often have to go unused. The remaining tonnage is enough for 3 free tons of ammo can keep its weapons fed for a good while, without completely relieving it of ammo woes. This one is as "poptart" as one gets. The 2 SRM2 launchers are there to threaten enemy's aim rather than its welfare. To maximize this effect the pilot is advised to fire them in succession of the other weapons instead of at once. Utilizing this break for the other two weapon groups, the cool LB 5-X trio and the ERPPC, are best used interchangeably as they become ready to fire. It goes without saying that this deadly ballet is rather a game of tough nerves than one of who shoots the fastest. Especially with the ever hot ERPPC on the table. The two main weapon groups both converge on 900 meters making thus the range slightly below 900m its sweet spot or a kill zone for slower targets. Cutting no slack for flyers or fast movers, the LB 5-X trio’s pellets move notably faster than a ppc bolt, meaning less target leading is required. The LBX also receives a bonus against flying targets and tanks. The weary pilot is advised to remember; firing both weapon types and simultaneously using its Standard Jump Jets ends up heavily taxing the two DHS. All in all, the E is a formidable, far reaching mech, ideal for a seasoned pilot who keeps an eye on his heat when the push comes to shove. The cheapest Thanatos variant due to a complete lack of supporting equipment and plain weaponry, the Thanatos F is by no means weak. Its weaponry consists of an LRM20 launcher for long range indirect fire support, an LBX10 for anything medium range or closer, and an array of beam lasers covering every size and range, from a single LBL, to a pair of MBL and 4 ERSBL. The Thanatos F is a versatile mech capable of engagements at every range, but a very tight sweet spot where all guns can fire, existing between the 400m reach of the small lasers and its missile launcher's minimum range of ~150m. 3 DHS struggle with the bursts of heat generated by the laser array and missile launcher, while its single free ton usually carries an extra nine shots of LRMs. Despite being able to rely on energy weapons, the asset will find itself making ammo runs often if it wants to sustain its peak damage potential. G is for Gauss here - the spare ton, the jump jets, and the enhanced optics all aid to exploit the best of the 31st century's ballistic weapons: the all mighty Gauss. Low heat, fast projectiles, low recoil - you name it - it has got it. The ERLBL pair compliments the arsenal even for even the fastest of targets up to 800 meters, because the mighty Gauss can fire only every so often. The direct fire arsenal is further complimented by an not as powerful, but somewhat better ranged, as well as faster paced LRM10 launcher. However the usual two DHS, even if kept functional at all times, will struggle heavily to keep it running cool, especialy when its Standard Jump Jets are used to poptart. The selling point of this Variant may be how well all its weapon systems fare against aerial targets. The Thanatos was designed as the first OmniMech of StarCorps Industries to be sold for Lyran Alliance or Armed Forces of the Federated Suns, though neither of them was interested in a new Omni design by the time prototype was ready. Because of large investment in R&D the chassis could not be abandoned easily, so the company management decided to transform it into a regular BattleMech. And so in 3061 a Mech made to duplicate Thor capabilities hit the market. The Thanatos, with maximum speed of 86 km/h and a jump range of 150m, is very maneuverable for a heavy BattleMech, making it a superb cavalry unit. Base weaponry includes an MRM20 launcher with 2 tons of spare ammunition, an Extended Range Large Laser, 2 Extended Range Medium Lasers, a single Medium Pulse Laser and an impressive set of electronics including an ECM Suite, a C3 slave and Jump Jets. 13 tons of armor gave this Mech respective defense. This page was last edited on 30 January 2019, at 19:01.